Discussion in 'Transformers Movie Discussion' started by juise, Jul 12, 2010. Sam's new ride! 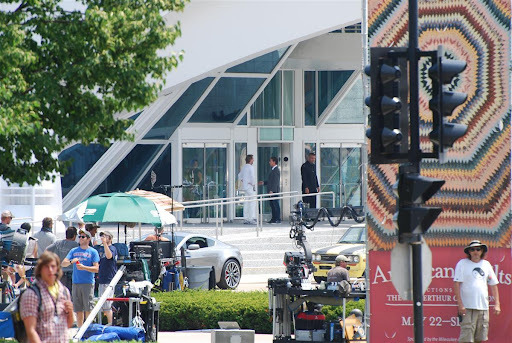 (Milwaukee set photos) Now with "Video". Hanypa and I just left the TF3 Milwaukee set and we have some pretty good pictures, and few news tidbits. Sam's new car seems to be a yellow '72 Datsun 510 with black rally stripes. Bay likes to shoot simple scenes a lot of times! For the two or so hours we were there, Bay shot Shia, Rosie, and Dempsy leaving the building and getting into the car (which wont start) at least 5 times! There's supposed to be another scene shot that involves a helicopter sometime today or tomorrow. No signs of Tyrese on the this set. I watermarked the pictures but tried not to be to annoying with them. Mods feel free to host them as they are for TFW2005.com only. Here's a stop motion of the pictures I took. This one might be a Aston or a Jag? I forgot to add this yesterday but Bay seemed visibly upset with Shia! Every time he stopped the shoot he got up and talked, and sometimes yelled at Shia. 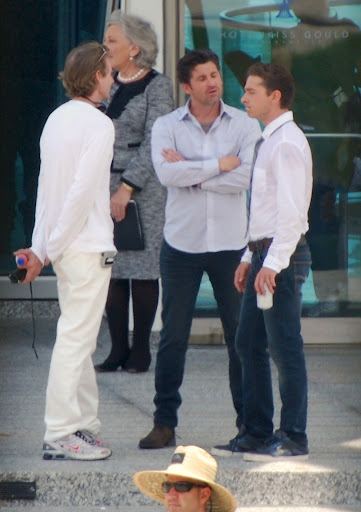 A few times Dempsy would kind of linger around Shia almost like he was trying to keep the peace. During down times you could see Shia going over practicing his lines and expressions. I moved the pictures to picasa since I hit the bandwidth wall on photobucket! Awesome great idea on the watermarks, this way for once a certain other site won't steal them! By any chance did you see a purple car there? Ceasar121 Wants a Toxitron repaint! Know what'd be funny? If Bumblebee took on that car form as a disguise. They are robots in disguise, and Bumblebee's shown that he can change his alt mode pretty much at will before. <shrugs> I dunno. Only cars on set were the Datsun and two silver Aston Martins. there's more of this car in the other thread. I think it's most likely a reformat, or some sort of decoy. I don't think the Datsun is going to be bumblebee, as you'll see later tonight the car does not start and Sam opens the hood and kicks it! The fact that it's yellow with Black stripes really has me wondering... NOt to mention that earlier, we saw two of them, so... Color me intrigued. Edit: Remember when Sam opened the hood when Bee wouldn't start in the first one? I hope you're right, it just seem... peculiar. The colour scheme on that Datsun has certainly got me wondering... maybe BB's Camaro alt mode becomes too recognisable to the 'cons to make it a viable disguise? Maybe Sam and new girl Rosie whatever her name is have to do some investigation for the autobots/nest. So bee reformats to sell there undercover story. Anyone else notice the "Bee-otch bee" hanging from the rear-view mirror in that first pic? Also notice it has the "Bee-otch" thing hanging from the rearview mirror like Bee had when he was the 70s camaro. If that's Bumblebee, then that is actually kind of interesting. Wonder what the angle is that he'd have to change alt-modes like this? Yup, I did right away. Also notice that this Datsun has a spoiler like Bee's camaro form has now. I think with the stripes and the yellow, it has to be Bumblebee. It sounds like maybe Bumblebee is messing with Sam for some reason. That place looks pretty fancy, so maybe Sam was trying to impress them, but his car is deliberately trying to make him look like a fool. Anyway, I'm sure Hasbro will be thrilled. Another Bumblebee for them to sell. Well-spotted! Maybe this is the company Sam goes to work for, but BB wants (for whatever reason) to stop him landing a job there, so reformats into a rustbucket and breaks down? Yeah, the Bee-otch pretty much confirms it, in my mind. Good eye. Did you get some pictures of those Aston Martins? PS: I send the mod a link to this thread so he can give you the news credit.